Scribble Maps is a simple tool for drawing on maps. It’s free but also has a paid version. This could work great for project 2 where students need to create regions to help them warn about the zombie outbreak. I know we’re getting to the end of the school year, but I’ve added a lesson on Presentation Skills and some rubrics for assessing presentation skills. Over time, I intend to add more 21st Century Skills rubrics and lessons, integrating them with current Zombie-Based Learning projects. Grade level rubrics are provided to assess presentation skills (based on Common Core Speaking and Listening standards) and integrating visuals into presentations (based on Common Core Literacy in Social Studies standards). This lesson can be worked into any project, Zombie-Based Learning or otherwise. Methodology: please note that the audience was provided closed-ended options, and asked to check all that applied–so answers won’t add up to 100%. Also, we provided a write-in box for open-ended answers. Measuring the “likes” I was gratified to see that teachers really did value having the important parts of curriculum including assessments, rubrics, and resources. Tied for the top favorite was that the curriculum is Project-Based Learning in practice. As a big believer in Project-Based Learning (PBL), I’m happy to see so many teachers valued the opportunity to use it in the classroom. Many teachers approve the theory, but are unclear on how to deploy it. Because I deliberately designed ZBL to be a good introduction to PBL, I’m glad to see that there are quite a few teachers who are motivated to get more training in Project-Based Learning techniques. It’s something we’ll be able to help with down the line! As for the “dislikes” beyond PBL training, 14% of the responses said that ZBL didn’t fit into their current plans. Additional write-in comments included a range of reasons such as “no longer teaching the subject” to “district not dedicating a full semester for Geography”. While I designed ZBL to fit into as many plans as possible, I was also pleased to hear that many teachers were able to modify it and fit it into their needs. The feedback was also very valuable to confirm the items we are eager to improve upon. We’re working on plans to make the curriculum materials more interactive, easier to download, and digitizing and updating materials to integrate with gradebooks and other valuable school tools. We also heard that a lot of students are clamoring for the next issue of Dead Reckon. We’re trying hard to get them out! We’re eager to share the continuing story as well, and are happy that students are enthused about it as we are. We’re thrilled to see that teachers are finding a lot of value in ZBL and the resources accompanying it to support their teaching. Between this survey and the student work we are getting from some of the teachers, we’re continually improving to be a more useful curriculum for teachers and a better learning experience for students. THANK YOU for your support and your voice! We sent this survey to all of the teachers on the Zombie-Based Learning mailing list. 36% of those teachers followed the link to the survey. 70% of the teachers who followed the link, completed the survey. In total, 25% of the teachers on the ZBL mailing list took the survey. Thank you to all who responded! I’ve been a big fan of ASCD ever since I started graduate school for teaching. ASCD publishes the best books on teaching and education. However, I had never been to the ASCD Annual Conference before this past weekend. Sometimes you don’t know what to expect from a big conference like that. You are never really sure if you are going to walk away with a bunch of ideas or just a big bag of free junk from companies you’ve never heard of. I’m glad to say I left with more ideas than junk and ASCD is my favorite education conference so far. Here are 5 reasons I’m glad I went to ASCD 2014 in Los Angeles. In the span of about 30 minutes I got to speak with 4 of my favorite current educational authors. 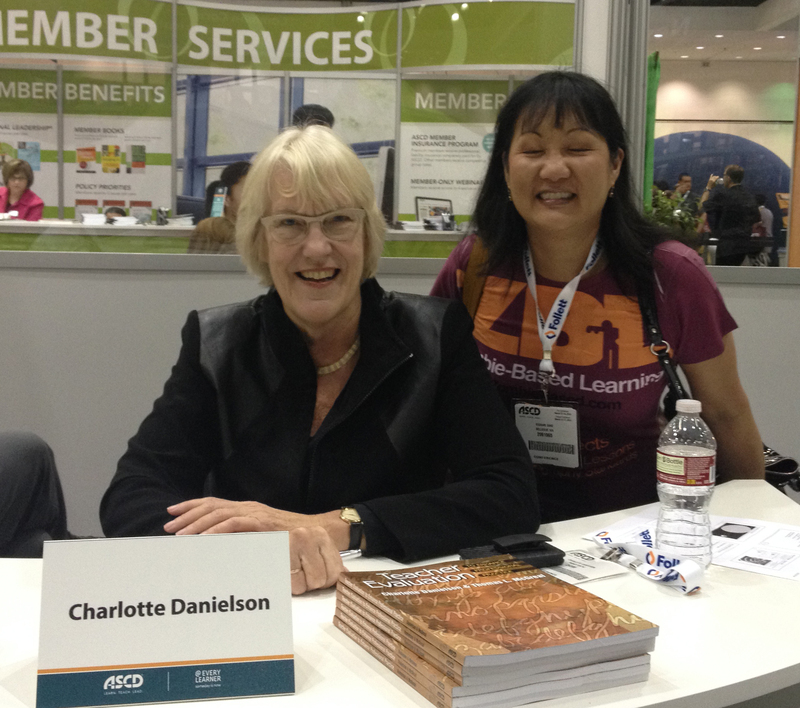 I met Charlotte Danielson, author of the Danielson Framework for Teaching, which I believe is a very valuable resource for assessing teachers. I used it both in graduate school and as a teacher. 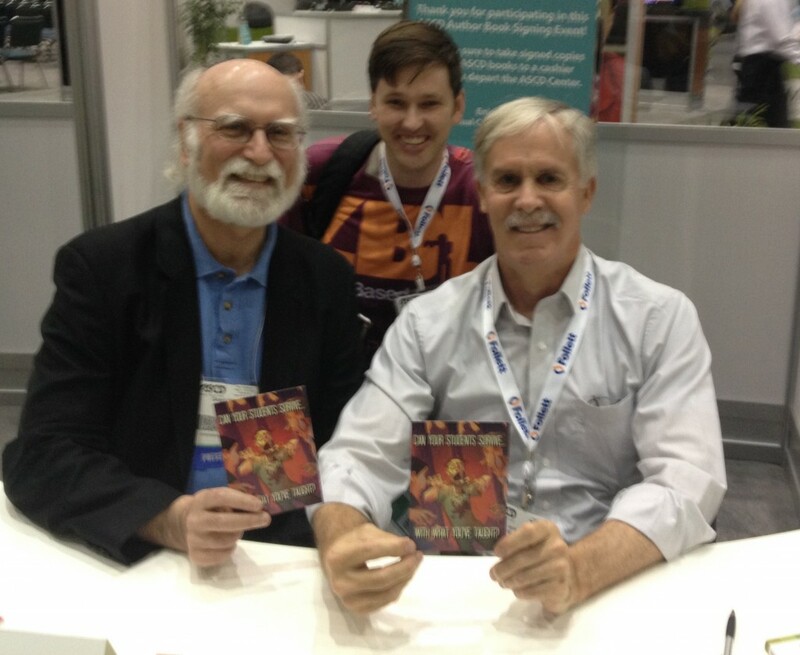 After talking with Charlotte, I turned around and saw the curriculum design super-duo “Wiggins and McTighe.” Grant Wiggins and Jay McTighe are the authors of one of my favorite education books, Understanding by Design. I’m really into curriculum design, and the root of my interests comes from their book. So I was really excited to talk to them and tell them how I nailed my first teaching interview because it was centered around my ability to design curriculum using the UbD framework. Here is a picture of me (David) with Grant and Jay. They had even heard of my work on Zombie-Based Learning. About 15 minutes after meeting Wiggins and McTighe, I got to speak with Robert Marzano and Sonny Magaña. They have just published a book, Enhancing the Art and Science of Teaching with Technology. I pointed out all of the new Classroom Strategies books I had gotten for Christmas, proving my educational nerd cred. I also got a chance to sit down and talk with Andrew Miller, a great writer for Edutopia and the Buck Institute as well as a thoughtful educator. 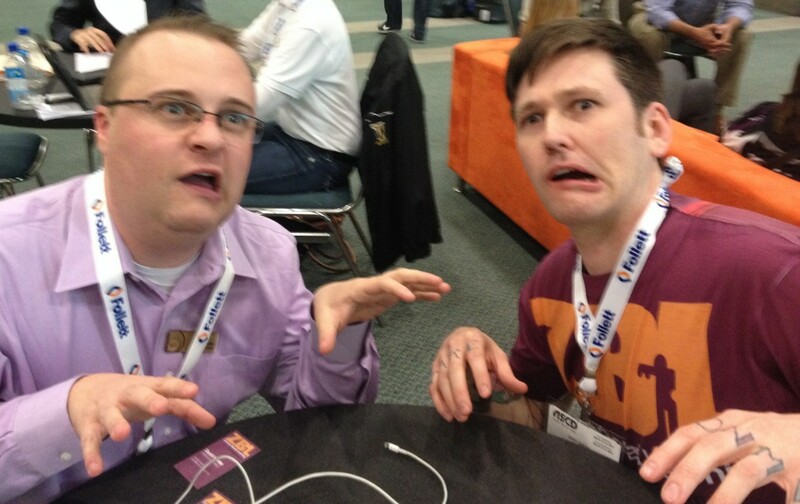 We talked Zombies and eventually turned into some. It is always nice to meet with fellow educational entrepreneurs and discuss our latest ideas. 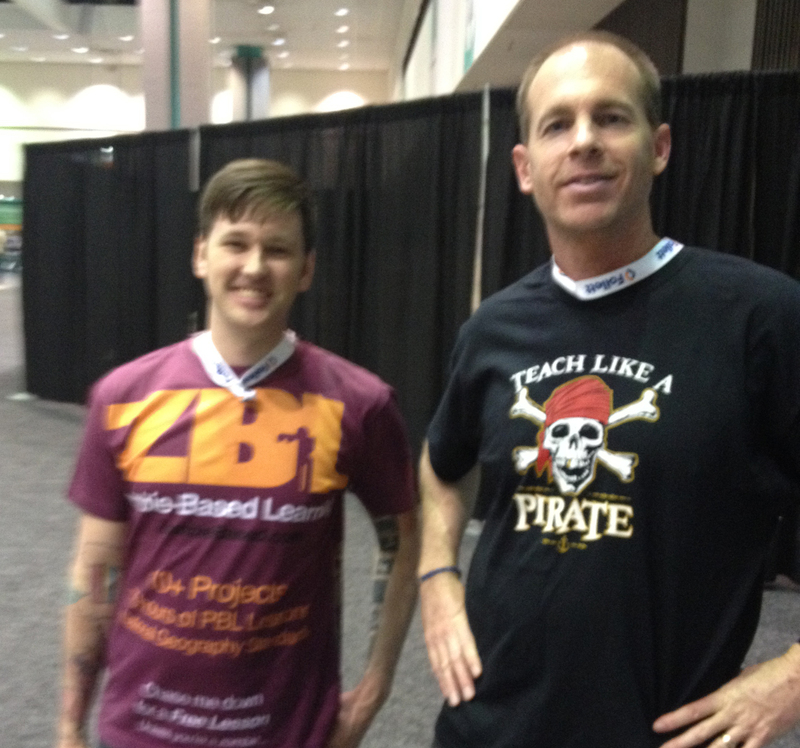 I got to spend some time with one of my favorite presenters, Dave Burgess, author of Teach Like a Pirate. We shared our latest strategies and feelings about education publishing. Here is a picture of myself and Dave. Representing Zombies and Pirates. 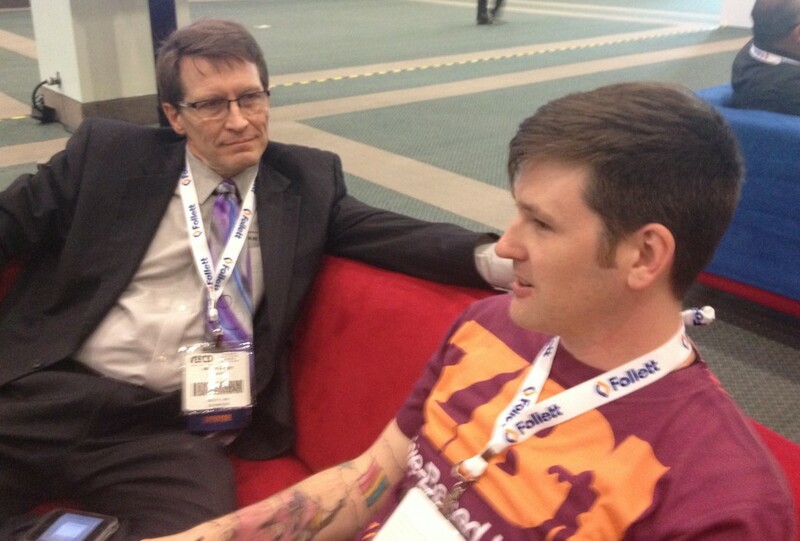 I also got to discuss ideas with the godfather of digital gradebooks, William Zaggle. William is now Chief Innovation Officer at Scantron. Here is a picture of William and I swapping stories of about our career as delinquent students. Sometimes I look at a conference program and I’m disappointed at how much it doesn’t excite me. Not the case with ASCD. I had quickly double booked my schedule with presentations I wanted to see. The ones I did catch, were excellent. The presenters shared theory as well as practical strategies for the classroom. My favorites included Margit McGuire’s presentation on “Accessing the Common Core for ELLs through Problem-Based Learning.” She provided valuable strategies for engaging English Language Learners in higher order thinking and aligning their work to Common Core Standards. View the slides from the presentation here. John Larmer presented on “Project-Based Learning: The What, Why, and How” which provided great strategies for using PBL. The presentations were great, the Featured Talks were world-class. Imagine getting to see your favorite TED Talks presenters live. That’s what it was. I saw Sir Ken Robinson twerk (it was easy to miss) as he shared insight from his latest version of The Element: How Finding Your Passion Changes Everything. I sat front row to hear Jane McGonigal’s latest research (coming out in a book next year) on how the way you approach games influences what you get out of gaming. I was even excited to hear her refer to lessons I’ve designed in the Q+A! And she was kind enough to retweet those lessons when I posted them afterwards. Wandering the floors of exhibition halls is tiring work. It doesn’t take long to get overloaded. But it is a great chance to check out the latest in education. I sat down at Adobe’s booth (partially because they had a seat and partially because I love the Adobe Youth Voices program). I got a short presentation of Adobe Presenter 9, which they’re really leveraging for teachers to use when they create flipped videos for the classroom. I would have benefited from that as a teacher (see my random range of flipped videos). 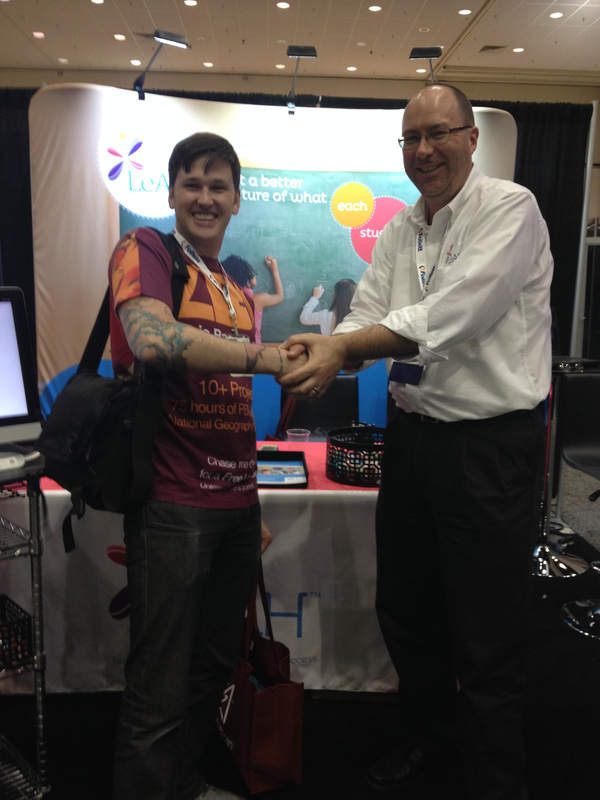 I also got to meet Matt Lavery, founder of LeAH assessment programs. View his TEDx Talk here. Here’s Matt and I talking about ways that we could work together to empower teachers through assessment. We got to walk around and either introduce ZBL to people or connect with people who were already fans. Here is one of the great shirts that we wore. Lots of people asked about where they could get the shirts. Maybe at ASCD 2015? I’m tired of people thinking of geography as memorizing locations and capitals. Geography is so much more. There are unlimited amazing questions that geographers take on to help us better understand how the earth affects us. In an attempt to help people imagine these big questions, I created the Geography Question Generator. It randomly creates questions that a geographer could explore. Right now it can generate about a couple hundred questions, a few might make a little less sense (no artificial intelligence in this tool). I’ll keep adding elements to it to create more questions. They mostly stick to broad topics in geography. My hope is that people will take a little bit of time to consider the exciting questions that geography can help us explore. 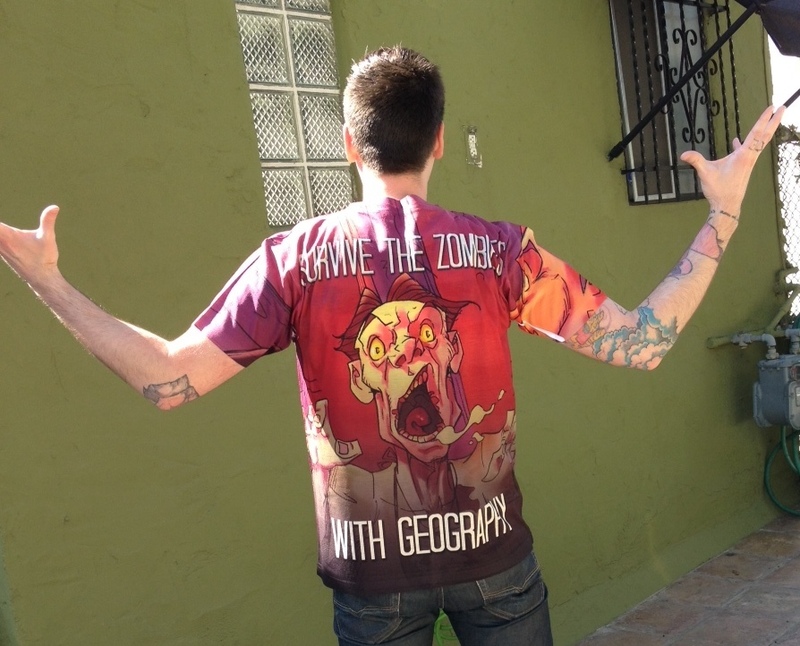 This tool goes great with the first lesson in Zombie-Based Learning, but can be used at any point to show that geography is a pretty deep field. 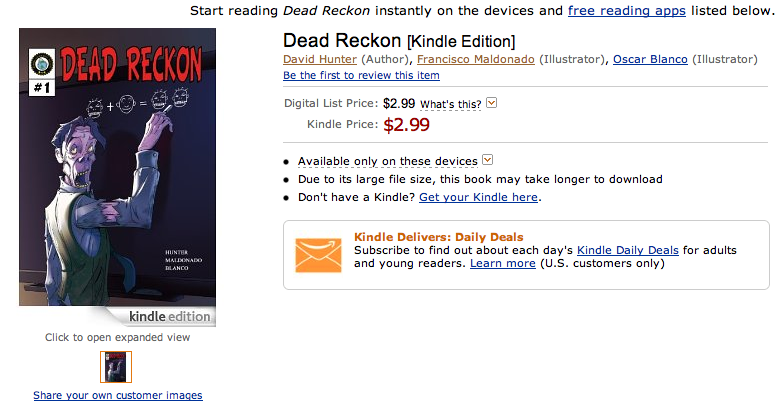 Dead Reckon is now available on Kindle! 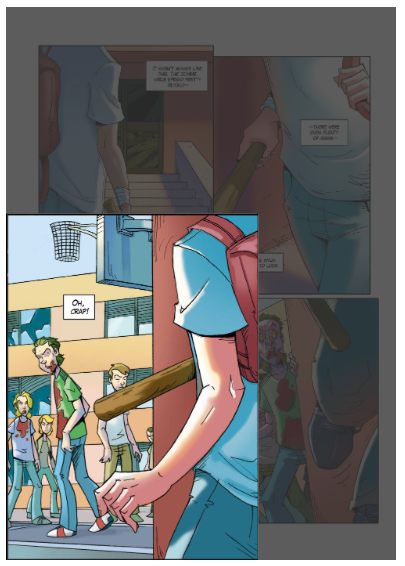 The comic has special functions to allow you to zoom into each panel. For Kindle users or Kindle app users, this will hopefully be an easier and even cheaper way to access the comic. The geography project notes are also included and zoomable as well. I’d love to hear any feedback on it. This was put together in a special way so that you can click on each comic panel and zoom into it. You can then progress through each panel automatically. I do a lot of comic reading on my mobile devices, and I really like being able to view a comic panel by panel. Hopefully you’ll enjoy this too. You can get a free preview on Amazon using the Kindle Cloud Viewer, it is very easy to do. See below for some instructions from Amazon. Amazon Kindle Device: Your sample will be sent automatically and wirelessly to the Kindle via Amazon Whispernet. Don’t have a Kindle? Get yours here. Free Reading Apps: Your sample will be sent automatically to your Android, iPad, iPhone, PC, Mac, BlackBerry, orWindows Phone 7 device. Don’t have a free Kindle Reading App? Download one here.